Any individual who is trying his best to make job interviews with top companies in the business world will tell you that scheduling an interview is no easy task at all. If the company is scheduling proper interviews for a number of people then things become easier. Yet if you would like to schedule one on your own, then there are a number of things which you have to keep in mind before doing so. Given here are some of the ways to go about making a interview appointment for job. Follow these things to the best of your ability so that you do not make a fool of yourself. Rather than just going right ahead and trying to schedule an appointment, there are a number of things which you need to know and keep in mind. If you go about making a job interview appointment in the wrong way, that will just point to the fact that you are someone who is new to the business world and doesn’t know how to behave in a proper way. It is very important to choose a medium which is sure and reliable. So no matter how eager you are to bag a job in a company, do not go ahead and act without thinking. That is just going to fill you with a sense of regret at a later point in time. As mentioned above you should pick a medium that is both sure as well as reliable however in addition to this you must ensure that the method which you choose is also effective. There is no point using a medium which is likely to be ineffectual. Ensure that you get a confirmation after you schedule an appointment. Companies have people who schedule these appointments, and if you do not hear from these people then chances are that they have not scheduled the appointment properly. So until you have heard from the company do not just take things lightly as you would not like to walk in on the day of the interview and find out that your appointment has not actually been scheduled. Rather than trying to figure out everything on your own, you could always be friend someone in the company and ask them about which medium they believe is most effective when it comes to making an appointment for an interview. Seniors in the company are always busy and they are surely not going to meet you without an appointment. So in that case who better to ask than someone who is actually working in the company? This individual can also give you some useful tips which are sure to get you noticed from the beginning. He or she might inform you about how the company website is not very actively checked and this information could really help you. At the very onset you must show yourself to be someone who knows how to conduct himself in a professional manner. If word reaches the higher authorities that you are someone who is very immature in your manner of working then it is unlikely that you will ever be able to make the appointment. Companies invest a lot of money in their employees and it is for this reason that they prefer to hire only the best. If you fall short on any front you will certainly not be hired. Be mindful of every action you take when it comes to your career. One wrong move could cost you heavily. Most often it is the HR department which takes care of things pertaining to appointments so if you can get in touch with someone in this department of the company, you will surely be able to go about things in the correct manner. Every company has its own rules and way of handling things so try and do things accordingly. Going about making the appointment in this way is very effective. A mistake which many people make trying to schedule an appointment for an interview is that they do not do things by the book. 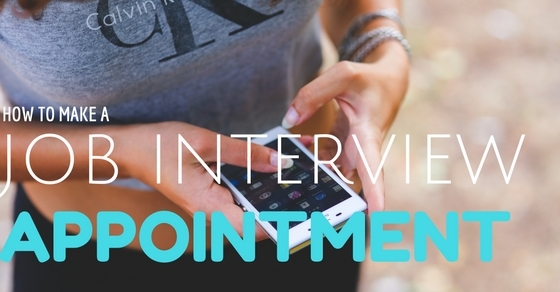 Scheduling an appointment for an interview is not an easy thing to do, yet you must be patient. Most of the top companies in the business world have a very informative website where information is updated on a regular basis. If you are confused about the way in which you apply to a company, the first thing which you need to do is check the company website. If you find that there is no information pertaining to how to go about scheduling an appointment for an interview then you can go about trying a new medium. Companies which have a very informative website usually do not like it when people keep calling for information. In this age of technology, if you want information all you need to do is go online from your laptop, tab or phone. A very simple thing which you can do in order to make appointment for an interview is to send in an email to the email address which has been provided on the company website. If the company is one which frequently checks the mails it receives then you will hear from them soon enough. However of all the available methods to make an appointment, many believe that this one is rather undependable given the fact that the company might be getting so many emails and might not even be checking each one that happens to land in their inbox. Chances are that your email might sit in the spam folder for a while before it is tended to. If you have a very good friend in the company who suggested that you apply for the job, then all you need to do is simply ask him or her to schedule an appointment of interview for you. Believe it or not this is a done thing in the business world and if the person has a high position in the company it might even give you an edge over the others who might be applying for the job. However make sure that the person you ask is a good friend of yourself. This having been said, you should not become someone who constantly seeks favors from others. If you would like to just schedule an appointment and you find that you haven’t heard back from any of the mediums which you have used, you can drop by at the office to find out what the problem is or whether they have failed to hear from you. Once you have got your definitive answer then you will know what to do. When you go to the office make sure that you are on your perfect behavior and not sounding rude at any given point in time. Many people say that this is the quickest method to get things done rather than having to wait around for an answer. There are many bosses who are always unavailable because they are so busy, yet there are some bosses who delegate their work in order to make themselves more approachable to others. So if you are lucky enough you might get a chance to go to the company and actually schedule an appointment with the boss himself. Chances of this happening in a multinational company are extremely less. However if you are applying to a smaller startup company (for example) setting up such an appointment is easier. So do not bank on this method as it is not something which happens easily. Just because you are trying your level best to get an appointment for an interview as soon as possible since you are sure that you will be able to bag the job, that does not mean that everyone else is going to work as per your convenience. Rather than have them working according to your schedule, you should be working around theirs. After all the company is likely to get 10 other people just as well qualified as you for the job, so to get employment might not be all that easy, given the fact that good jobs are so very hard to find nowadays. So no matter what you are feeling, keep calm and have faith that things will fall into place. When you make a appointment for job interview, ensure that you are not making the appointment very early in the morning. If you do this, chances are that the person is going to be very busy and will be unable to give his entire attention to you. If the person seems distracted with other preoccupations, chances are that you too will not be able to focus on what you are saying. Many experts believe that scheduling an appointment for Monday morning is one of the worst things you can do. Since after the weekend, the person taking your interview is bound to be so busy with so much other pending work. In addition to not making an interview appointment for very early on in the day, you should ensure that you do not make your appointment at the tail end of the day. At this time the person is bound to be very tired, restless as well as eager to go home. You would certainly not be at ease talking to someone who is showing signs of irritation and is desperate for you to speak faster. It is advisable that you try to make your appointment immediately after lunch hour, when the person appears to be well rested and can talk to you in a cool calm and collected manner. If you know for a fact that the company does things on the phone then rather than fussing too much about the medium to use for making the appointment, all you need to do is pick up the phone and schedule one immediately. Doing so during office hours is a very good idea. This having being said, try not to correspond by SMS as that is something which often leads to a great deal of miscommunication. Above everything else when it comes to making a job interview appointment you must ensure that you keep yourself free and available. It is very important that you decide on a date when you are completely free. Chances are that your appointment might be delayed for a while if something comes up, but if you really want the job you should be prepared to wait. Many years ago people could just walk into companies and get to meet the boss immediately, however nowadays, this is something which is a near impossibility. Companies hate it when people just walk into the company seeking an appointment immediately. Given the present global economic condition, companies do not like to hire too many people on board and the people who they do hire are the best of the best. So ensure that you go about making the appointment in a proper manner lest you will be dismissed as someone who has no respect for the company and does not know how to do things in a proper as well as professional manner. Next articleHow to Make your Goals and Wishes Come True?